PokerStars announced today that French Canadian Marc-Andre Ladouceur has signed on as a member of Team PokerStars Online and he will play under his username “FrenchDawg”. Ladouceur has held Supernova Elite status on PokerStars since 2010 and his username is one of the most recognized on PokerStars. Players can normally see him playing $25/$50 limits and above. He is no stranger to live play as he finished 63rd in the 2011 WSOP Main Event and walked away with a cool $130,997. Twelve short months later he walked away with a big payday of $465,159 when he finished 12th in the 2012 WSOP Main Event. Ladouceur went to twitter to tell everyone the exciting news about joining Team PokerStars Online. 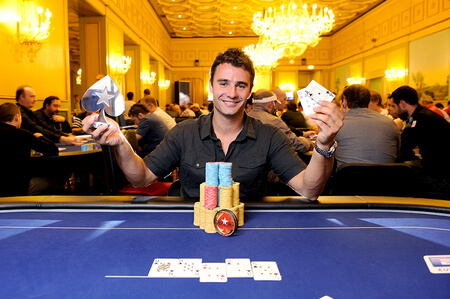 PokerStars Team Pro member Jonathan Duhamel went on twitter to congratulate the newest member of the PokerStars family.